You’ve worked hard over your wage-earning career to accumulate a nest egg you’re proud of. You’ve saved, invested and planned, and now it’s time to think about the next step: withdrawing your savings. If you’re close to retiring—and even if you have a decade or two to go—be sure to set yourself up for financial well-being all the way through your twilight years. 1. Before you retire, pay off all debt including your mortgage. Debt in retirement will shackle you to payments, which can bust your post-retirement budget. If you’re nearing retirement, slash your debt now with gazelle intensity. That’s right—car loans, consumer debt and even your mortgage need to go. Start by listing out all your debts smallest to largest to determine how much you owe. Next, calculate how long it’ll take to pay off the debt and how many years you plan to continue working. If you can get rid of all your debt before you retire, great! Get busy and clear the debt! However, if you think there’s no way to clean up the debt before you retire, you might need to make some drastic changes. First, consider working a few more years so you can retire debt-free. That can be a tough call if retirement is just around the corner, but retiring without the financial and mental burden of debt will be well worth the effort. Now keep in mind, selling your home to pay off debt is not the right solution for everyone. If you love your place and you’re close to paying it off, or if your mortgage is a small percentage of your post-retirement take-home pay, by all means keep the house! But if you have a lot of debt and a big mortgage, downsizing to become debt-free before retirement could be worth it. Another word to the wise: Never cash out your 401(k) or other investments to pay off debt. You’ll get hit with taxes and penalties—in some cases 40% of your savings. (3) At this stage in the retirement savings game, you need to keep your cash and not give it away in taxes and penalties. Take on side work. If you’re ready to leave the workforce but want to earn extra cash to use for vacations and fun money, take on a side business you enjoy. According to the Transamerica report, 65% of workers dream of traveling, followed by spending time with family and friends (56%). (7) So take on an enjoyable hobby that can generate a little revenue to cover extra expenses. That’s less money you’d have to use from your savings! If you take out a lump sum, stay conservative with your withdrawals. If you have $500,000 saved for retirement and you take out $60,000 a year, you’d have enough money to last over 11 years. However, if you took out $48,000 a year, you’d have enough money to last over 17 years. Keep in mind, every situation is different. Each investment comes with its own unique tax implications and withdrawal fees, so be sure you check with your advisor to understand what’s required when you withdraw your funds. Bottom line: Establish a plan with the help of your advisor that ensures you have sufficient savings through the duration of your retirement. 3. Know what you have in retirement savings. Know your number: Use Chris Hogan’s Retired Inspired Quotient (R:IQ) assessment. Get with a financial advisor, if you don’t already have one, to compare the amount you have saved for retirement to the amount of savings you’ll need to carry you through your golden years. An investing pro will help you gain a clear picture of what you need to do now to get those numbers to line up by the time you retire. If you’re a few years away from retiring, you can estimate your monthly Social Security benefits. Otherwise, if you’re decades away from retiring, you’ll need to save and invest as if Social Security won’t exist in the future. If it does exist, treat it like a bonus. Keep in mind that as it stands now, Social Security replaces only 40% of a person’s pre-retirement income. (9) Look at it this way, if your pre-retirement annual income is $55,000, right now Social Security will only replace around $22,000. You’ll need another $33,000 per year to maintain your pre-retirement income. Ideally, that gap would be covered by your retirement savings. 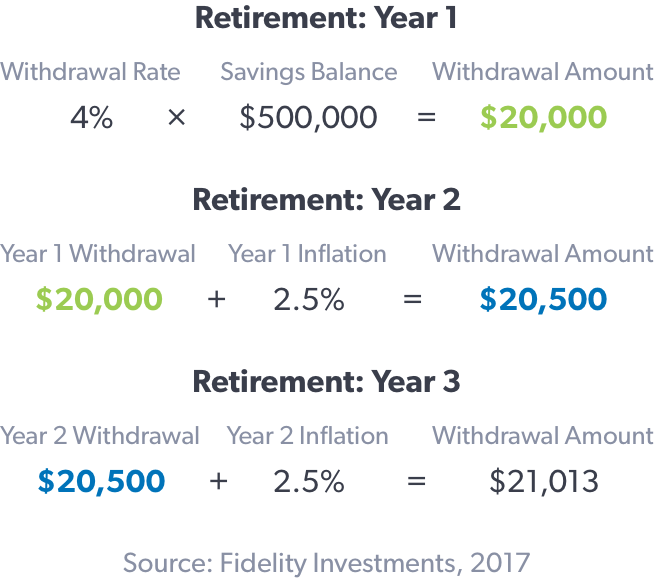 A simple calculation shows that $33,000 multiplied by 20 years of retirement comes to $660,000—the amount you’ll need in savings to bridge the gap between Social Security benefits and your pre-retirement income. Realistically, retirees will most likely need 70% or more of their pre-retirement annual earnings to maintain their lifestyle throughout their golden years. (10) Keep in mind, there are many complex financial variables like market volatility, inflation and cost-of-living adjustments that will impact your overall personal retirement savings equation. That’s why it’s important to talk with your financial professional. They’ll walk you through those variables and help create a custom plan for your retirement. If you’ve saved your money for years in preparation for retirement and are unsure about how or when to start using your investments, a professional can guide you through the process. The right advisor will empower you to make the best decisions for your future and keep you in the driver’s seat. If you need help finding a financial advisor, check out a SmartVestor Pro near you. SmartVestor Pros are qualified investing professionals who can help with your retirement needs.